Rodney Young was born in England and came to Canada in 1926. He joined the Cooperative Commonwealth Federation in 1934 and became a spokesman for the left wing of that party. During his years in the CCF, he served as national vice-president of the Cooperative Commonwealth Youth Movement and second vice-president of the British Columbia CCF. During World War II, he served in the Royal Canadian Corps of Signals. From 1948-1949, he was MP for Vancouver Centre. He later opposed the CCF's "drift to the right" and resigned from the party. 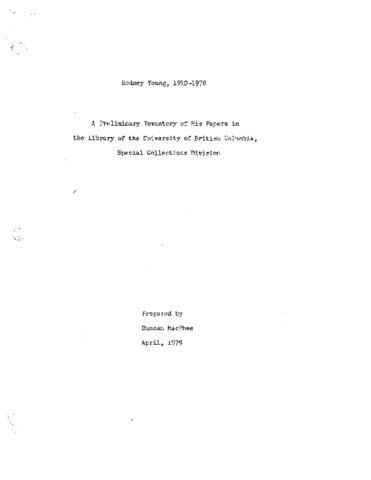 The fonds consists of correspondence, speeches (including Young's parliamentary addresses), clippings and scrapbooks pertaining to Young's career and political views, as well as publications, constitutions and bylaws, newsletters, notices, and minutes pertaining to the Cooperative Commonwealth Federation. Also included are university essays on socialism, economics, and international affairs collected, but not written, by Young.